Designer, blogger, podcaster, teacher…Marly Bird has an infectious love for fiber. She knits and crochets, designing in both mediums. Not a day goes by without picking up a hook or needles! Be sure to check out her live podcast for interviews with other crafty folks. Former guests have included Trisha Malcolm from Vogue Knitting, Benjamin Levisay from XRX Books, and designer Sheryl Thies, to name a few! Marly says, "Eucalan was my first wool wash soap I ever used and have been a fan from the beginning. Whenever I smell my favorite Eucalan scent, lavender, it makes me think of finished projects!" 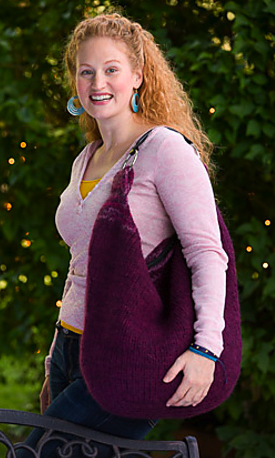 This roomy bag is knit, then felted to a slouchy bag you'll want to use wherever you go! It's a great beginner project and makes a fabulous gift for yourself or a fashionable friend! This shawl features sumptuous yak/bamboo yarn from Bijou Basin Ranch in an array of hand-dyed colors. Marly combines garter stitch with a scalloped lace edging to show off the subtle nuances of hand-dyed yarn. Currently part of an exclusive Knit-a-long, the pattern will be available soon as a PDF download on Ravelry! Recently published in the November/December issue of Crochet Today!, Marly's latest crochet creation is perfect for gifting. Mother-in-laws, cool grandmas, any woman on your list will look great in this airy, versatile shawl made with “magic” yarn, which changes color and texture as you stitch.